Managing Your Mind is a book for building resilience, overcoming emotional difficulties and enabling self-development. It is for any of us who wish to understand ourselves better, to be more effective in day-to-day life, to overcome current problems; or who want to support others in these tasks. The authors have between them almost 100 years of experience helping people respond skillfully to life's challenges. Drawing on this experience as well as on cutting-edge scientific research, Managing Your Mind distills effective techniques and ideas, enabling readers to select those that suit their preferences and needs. Part One of the book helps us gain a better understanding of ourselves and provides tools for clarifying what we value most in life. It highlights the benefits of the practice of acceptance and kindness, and shows how to build self-esteem and self-confidence. Part Two presents practical tools and methods, relevant to everyone, for making our way in the world. This includes the importance of perspective and how we can best use our thinking skills. It also covers everyday topics such as the value of useful habits, time management, looking after our physical health, increasing happiness, well-being and creativity, and developing and maintaining good relationships. The third part of the book provides scientifically-tested approaches to overcoming specific emotional difficulties, such as worry, panic, low mood, anger, addictions, and coping with trauma, loss and chronic ill health. 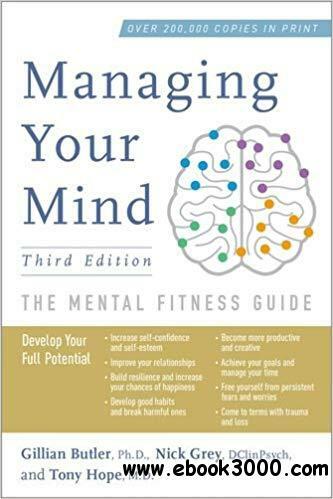 With well over 150,000 copies in print, Managing Your Mind remains the definitive self-help guide for anyone seeking to lead a more fulfilling and productive life.